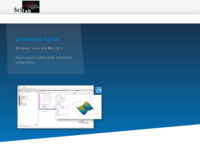 Scilab is a scientific software package for numerical computations providing a powerful open computing environment for engineering and scientific applications. Scilab is currently being used in educational and industrial environments around the world. This homepage managed by Scilab developers INRA and ENPC, outlines the features of Scilab software. Users can also link to Scilab related events, training and workshops, FAQs, a how to page, demonstrations, downloads and related links. Scilab software works on most Unix systems including Linux and on Windows 9X/NT/2000/XP.